The new Stryker Interim Armored Vehicle (IAV) of the U.S. Army has attracted a lot of attention since its introduction several years ago. While it has come in for some strong criticism from some quarters, this volume offers an objective look at this important new wheeled armored vehicle of the U.S. Army. In Carl Schulze’s inimitable style, he outlines how the Stryker fits in with the Army’s Interim Brigade Combat Team philosophy. In actual fact, the Stryker is based on a tried and tested formula, with this GDLS/MOWAG vehicle already in service with countries such as Canada, Denmark, Ireland, New Zealand, Spain and Switzerland. 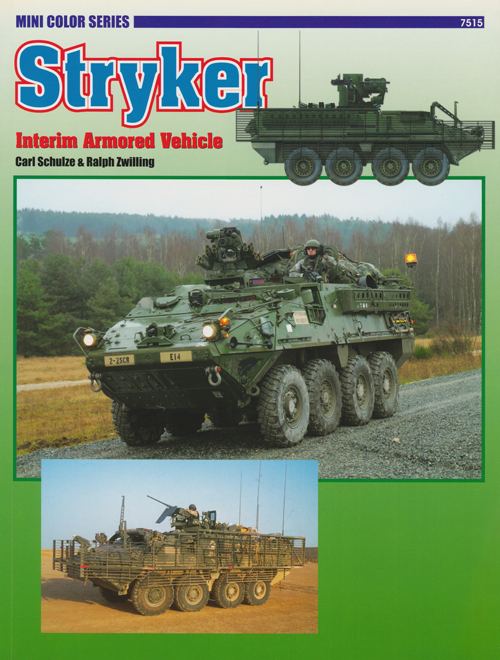 This volume provided an enormous amount of detail about the Stryker, and the vast majority of its pages are devoted to examining the different variants in photographs and in written descriptions. Excellent detail is provided on the standard Infantry Carrier Vehicle, Reconnaissance Vehicle, Mobile Gun System, Mortar Carrier, Command Vehicle, Fire Support Vehicle, Engineer Squad Vehicle, Medical Evacuation Vehicle, ATGM Vehicle, and NBC Reconnaissance Vehicle. For this book, the duo of Carl Schulze and Ralph Zwilling has succeeded in collecting a tremendous range of photos. They mostly show vehicles in action operationally in Iraq, as well as on exercise in Germany. This means the slat armor system employed on Strykers deployed to Iraq gets good coverage also. For modelers or military vehicle buffs interested in this impressive new vehicle, then this authoritative book should be the first port of call!